Are you running your organisation or running your IT? Partial – for customers who already have IT personnel on-site but need Save9 as an extra technical support resource. Save9 specialises in solving long-term IT challenges – perhaps resolving technical issues that current IT provision has been unable to tackle. 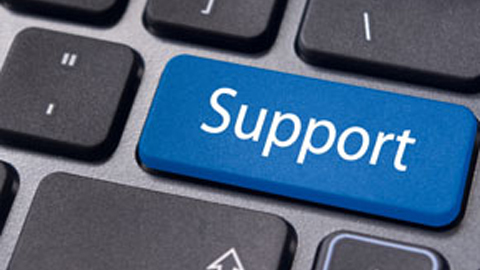 Full – remote and on-site IT support cover for customers who do not have an on-site IT Manager. It is the ideal solution for small to medium sized businesses who need professional technical support backed by a second and third-level IT helpdesk team. ITIL (version 3) is a framework of best practice approaches intended to facilitate the delivery of high quality IT services. It outlines an extensive set of management procedures that are intended to support businesses in achieving value for money and quality in IT operations. Our goal is simple: to facilitate the rapid restoration of your normal operational IT services with minimal business impact on your organisation. Cost reductions are a necessity in today’s economy and IT support and operations are a frequent cost reduction target. Service helpdesks and IT support providers need to ensure that their services are clearly defined and aligned with business needs. 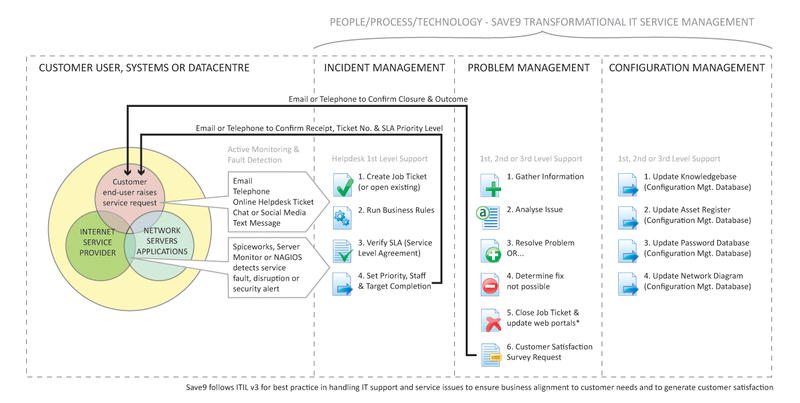 The Save9 Service Desk is a single point of contact for your end-users who need help with their IT. Without this single point of contact your organisation would face major losses in time spent on looking for ways to fix issues and get help. Each Save9 IT Support contract is actively monitored and evaluated under an agreed minimum response-time SLA (Service Level Agreement) mapped to key performance indicators; please ask for a copy of our standard SLA document and Severity Level definitions. The value of outsourcing specific areas of your IT to Save9’s experienced team of IT helpdesk professionals can be significant. Save9’s specific service offering is for customers like you – in terms of our skill sets, knowledge, reliability and availability out-of-hours. Lean IT is a business and technology imperative for increasing value and reducing waste in the delivery of business processes and systems including IT support services. This process inherently cuts out complex procedures whilst decreasesing the likelihood of IT problems reappearing in your organisation. Save9 embraces Lean from three perspectives — people, process and technology — and puts everything in the context of a customer’s business and systems environment. Lean is a way of thinking and working that enables application development and IT support professionals, business process experts and information managers to work closely with our customers to more rapidly assemble solutions that deliver, just in time, the outcomes you expect. 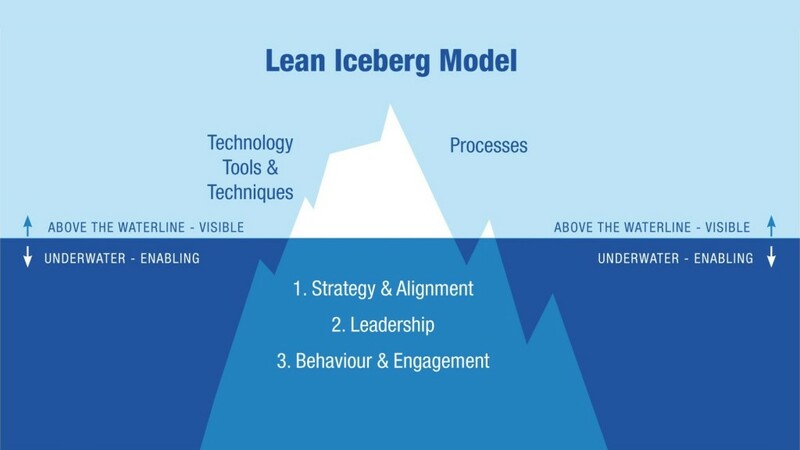 The Lean Iceberg model is something we’ve recently adopted – it encourages our staff to not just consider and employ effective IT solutions, processes and techniques – but to consider whether our organisation has a clearly aligned strategy to customer-focused service delivery. Our helpdesk staff need the right behavioural attitude when dealing with negative IT issues or frustrated end-users, so producing a positive organisational culture conducive to successful IT service delivery and happy customers is critical to our success. We believe Lean is the best way to deliver Agile, fit-to-purpose, efficient solutions and is a big change from how a business and IT typically work together. 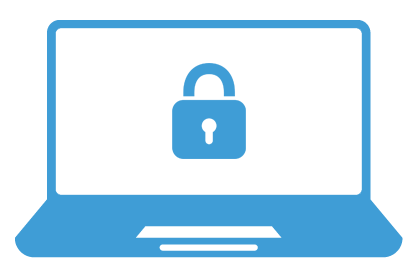 Our base-level IT Support starter package provides basic remote desktop support to you and your end-users during normal office hours (9am to 5.30pm, Mon-Fri). We ensure operational reliability of your business by guaranteeing minimal 8 Hour (SLA) support reponse times from our IT helpdesk engineers. Typical response times are 1.5 Hours. What’s covered? Remote IT assistance for desktop PCs, laptops, office applications, Office 365 (Mail, Calendars, Contacts & Tasks), internet access and network printing. Our IT Helpdesk deploys a remote monitoring system called SCOM (connected over the internet via a secure VPN link) to watch key operating system and application services running on your Windows or Linux servers. 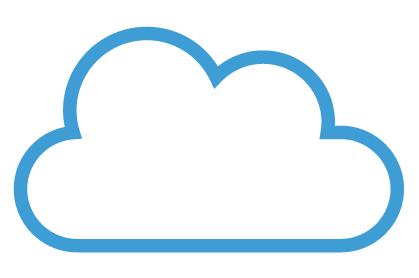 For example, we will ensure you have plenty of available disk space on your servers and that your backups do not fail. What’s covered? Remote IT assistance for server systems, software patches, security updates, performance metrics, anti-malware, backups, SQL/MySQL database reliability, virtual servers (Hyper-V or VMware) and Active Directory/LDAP user and group management. Our network engineers deploy remote network monitoring tools (connected over the internet via a secure VPN link) to watch key network services running at your site(s) – making sure your end-users and critical LANs (Local Area Networks) or WANs (Wide Area Networks) operate at maximum efficiency without interruption. What’s covered? 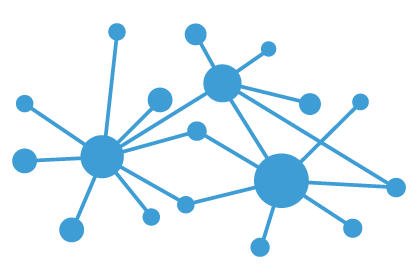 Remote and on-site assistance for network switches, fibre interconnects, firewalls, routers/modems, wi-fi, 3G/4G routers, printers, virtual networks and SD-WANs.